New Book Release: Yehi Shalom! Revised and Reprinted – Second Edition! 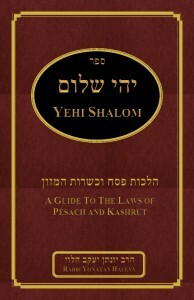 “Yehi Shalom: A Guide to the Laws of Pesach and Kashrut” is now available! ORDER YOURS NOW! List price is $25 but we are offering the book for just $20 in honor of Pesach! If you wish to pick-up your book in person, choose the second option. The book can be shipped anywhere in the US for an additional $5. If you wish for your book to be shipped to your location in the US, choose the first option. Yehi Shalom: Shipped anywhere in the US for $5.